Sterling Silver and Turquoise Stud Earrings from Mexico, "Mayan Heritage"
Guillermo Arregui works in Mexico's renowned sterling silver mined in Taxco to create excellent pieces of jewelry. He designs this pair of stud earrings, which he carefully crafts by hand. 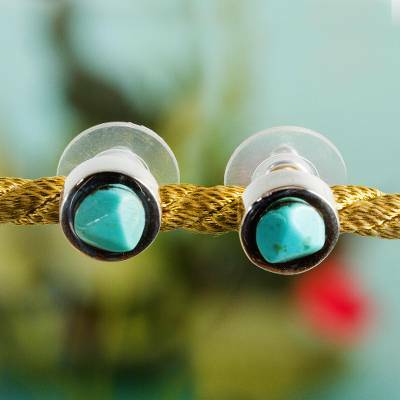 They feature serene natural turquoise for a look inspired by the Mayan culture. 0.6 cm H x 0.9 cm Diam. 0.2" H x 0.4" Diam. Mayan Jewelry Office Wear Pieces These Are My Birthstones.. Love Them!! These Are My Birthstones... Love Them!! "PERFECT IF YOU WERE BORN IN DECEMBER..."
THESE ARE MY BIRTHSTONES... LOVE THEM! !